Last night I attended the Burt's Bees HIVE Tea to celebrate the launch of their new and improved 24hr Moisture Lotions. It took place at the Swarvorski Crystallised Lounge in Soho, and had been decorated gorgeously - with honeycomb shapes on the wall, and displays looking all lush and natural with the new products resting on grass and daffodils 'planted' around the seating. You could have your nails done, or chill out eating yummy little cakes. The creator of the range, Abina Antwi, was there, giving demonstrations and whipped up a moisturiser right in front of our eyes using all natural products and an electric whisk - it really was amazing! The theory behind it is that if you can eat it, it's going to be better for your skin - and these moisturisers really do smell good enough to eat! Abina explained that the new formula contains liquid crystal emulsions which are in the same state as those in our bodies which means that the nutrients from the moisturisers absorb into our skin better. They have been tested and apparently really do provide 24hr moisturisation! Richly Replenishing Body Lotion for dry skin - made with Cocoa and Cupuaca Butters and botanical moisturisers Sunflower and Olive Oils. 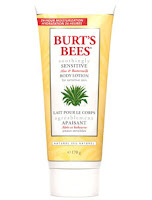 This smells of Cocoa Butter and a hint of Vanilla - scrummy! 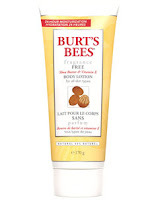 Fragrance Free Body Lotion for all skin types - made with Shea Butter, Vitamin E and botanical moisturisers. 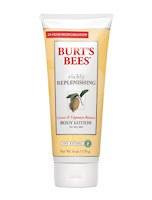 They are priced at £9.99 for a 6oz bottle and are available from April 2011 from burtsbees.co.uk, Boots, John Lewis and selected independent stores worldwide. 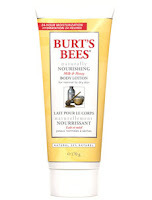 Burt's Bees are looking for someone to try out the 24hr Moisture Lotions for their Mirror Diaries campaign. If you are over 18 and are interested, you can find all the details here.